Bursitis is a condition which is commonly caused by overusing a particular joint such as the shoulder, elbow, knee or hip. It is caused by daily, repetitive motion, and often affects people like musicians, athletes, carpenters, and gardeners due to the nature of their work. Bursitis can be painful and prevent you from carrying out your normal daily activities. It usually resolves naturally over time, but there are a number of things you can do to speed up the process. One of these is earthing, also known as grounding. This is the practice of bringing the body into conductive contact with the earth to bring about a wide range of health benefits. 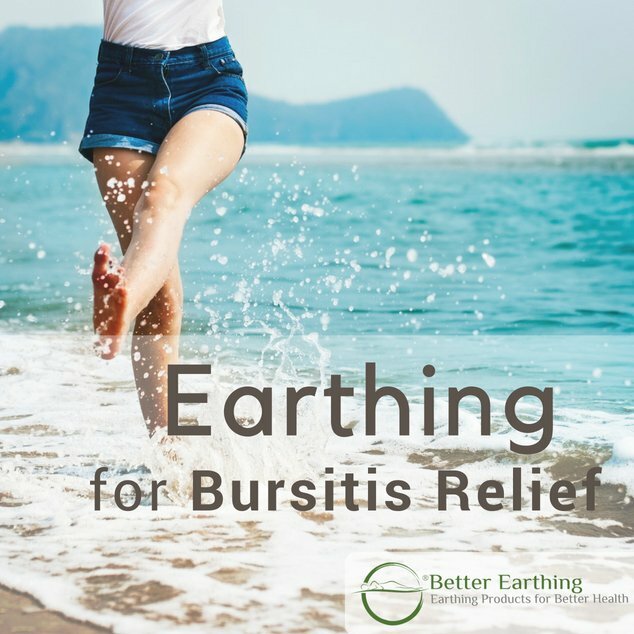 Earthing can help to reduce inflammation and relieve bursitis symptoms naturally, speeding up your recovery time and reducing the need for medication. See other benefits from earthing here. A bursa is a fluid-filled sac which sits between the bones and tendons of a joint. It provides cushioning, reduces friction and allows freedom of movement. Sometimes bursae can become inflamed. This could be due to repetitive movement, injury, infection or inflammatory conditions such as rheumatoid arthritis or gout. When a bursa becomes inflamed, it fills with excess fluid. This causes swelling and loss of mobility in the affected joint. As well as stiffness, bursitis can cause aching or pain which is often worse at night. The joint might feel sore or tender when you touch it, but the pain is often relieved when you are active. The joints most commonly affected by bursitis are the shoulders, elbows, wrists, hips, knees, and ankles. The most common cause of bursitis is overuse of a particular joint. This is why it usually affects people who have jobs or hobbies which require repetitive movement. This includes manual labourers and people who play sports or musical instruments. Over time, the overused joint becomes inflamed leading to stiffness, loss of movement and pain. Bursitis can also be caused by an injury or infection, both of which cause inflammation as the body struggles to defend itself and heal. Other risk factors for developing bursitis include conditions such as diabetes, rheumatoid arthritis, and gout. Older people and people who are overweight are also more likely to be affected. Bursitis pain is often worse at night. This can make sleep difficult as you may be unable to find a comfortable position or be woken up by pain during the night. Lack of sleep not only leaves you feeling tired, but can also reduce your body’s ability to repair itself, meaning that healing is delayed. One way to relieve your nighttime bursitis pain and improve sleep is by adjusting your sleeping position. The best position to sleep in is lying on your back with a low, firm pillow. This allows your spine to rest in a natural position and takes some of the pressure off your joints. Experiment with pillows, placing one under your knees when lying on your back, or between them if you sleep on your side. If you find a pillow too thick, you can try using a folded blanket instead. If you have been suffering from bursitis for a long time or have regular flare-ups, you might also want to look at changing your mattress. Having a mattress that is too soft or too hard can cause discomfort and aggravate joint pain. The most important treatment for bursitis is rest. This allows the body to repair itself naturally, reducing inflammation and relieving stiffness and pain. With proper rest, bursitis will often go away by itself over the course of a few weeks. However, it can often flare up again later, especially if you go back to doing the activity that caused it in the first place. Other treatments include anti-inflammatory medications such as non-steroidal anti-inflammatory drugs (NSAIDs). These include drugs like ibuprofen and naproxen. They work well to relieve inflammation and pain but can cause side effects. The most common of these is irritation of the stomach lining which can be reduced by taking NSAIDs after food. Your doctor might recommend an anti-inflammatory steroid injection into the affected joint, and if there is an infection, you will need antibiotics. In severe cases of bursitis, surgery might be necessary. There are plenty of natural ways to relieve bursitis, reducing the need for medication and improving your recovery time. Rest is the most important factor in helping bursitis to heal naturally. Avoid any activities that aggravate the condition and choose gentle exercise such as stretching rather than high impact activities like jogging. If your bursitis is in your hip, knee or ankle, you might want to consider temporarily using a walking stick to help relieve the pressure on the joint. Icing is another way to reduce inflammation naturally. Apply an ice pack wrapped in a towel to the affected joint for 20 minutes, three to four times daily. Some people also find that gentle heat helps to reduce pain and stiffness. Experiment with hot and cold and see what works for you. Try eating an anti-inflammatory diet which is high in omega 3 fatty acids (found in oily fish, soya products, nuts and seeds), fresh fruit and vegetables and whole grains. Avoid processed or fried foods, refined sugars, caffeine and alcohol which can all increase inflammation and aggravate bursitis. Prevention is always better than cure, and if you are at risk there are a number of steps you can take to reduce your chances of developing bursitis or having flare ups. Take frequent breaks from any repetitive activities and use proper equipment when working or playing sports. If you kneel for long periods, wear knee pads. Use a proper lifting technique and wheel any loads that are too heavy to carry. Regular exercise is a good way to strengthen your muscles and protect your joints. If you are overweight, exercise will also aid weight loss which can help to prevent bursitis. Just remember to warm up properly before, and stretch and cool down after any physical activity. Another way to relieve bursitis naturally is earthing. This is the practice of bringing the body into conductive contact with the earth’s surface to bring about a wide range of benefits. These include reduced inflammation and pain and better sleep. Earthing can be done by simply walking barefoot on a conductive surface such as grass, sand or unpainted concrete, or by using an indoor earthing product. Earthing works by taking advantage of the earth’s rich supply of free electrons. In the body, these act as powerful antioxidants, neutralizing harmful free radicals which play a major role in the inflammatory process. You can read more about how earthing works and the many health benefits of earthing. Although there are currently no studies specifically on bursitis and earthing, there is good anecdotal evidence for its effectiveness. There has also plenty of research into earthing’s ability to reduce both inflammation and pain. Bursitis develops when the fluid-filled sac surrounding your joints and tendons becomes inflamed. Studies have shown that earthing can effectively reduce inflammation and relieve pain, meaning that it could also reduce the symptoms of bursitis. This study looked at the effects of earthing on delayed onset muscle soreness (DOMS). This is a common inflammatory condition that occurs following vigorous exercise. In the study, all of the subjects were asked to perform an exercise which induced DOMS in their calf muscles. Following this, half of the subjects were earthed using patches and conductive sheets. The other half were sham earthed as a control group. Another study by Dr William Amalu, President of the International Academy of Clinical Thermography used thermal imaging to show how earthing reduces inflammation and pain. Patients at an out-patient treatment centre were randomly selected as they presented for care. Some were given clinical earthing at the centre while others were provided with conductive sheets to use at home. The study showed that earthing consistently reduced inflammation and relieved pain in all of its subjects. A further study showed how earthing can improve sleep and relive pain at night. 12 subjects, all suffering from poor sleep, emotional stress and pain slept on conductive sheets for a total of eight weeks. This suggests that earthing could be a fast and effective solution to the pain and loss of sleep associated with conditions like bursitis. Earthing overnight optimizes its ability to improve sleep and relieve night time pain. You can do this by using earthing bedding products such as an undersheet, sleep pad or pillow case. These products are interwoven with conductive fibres and can be connected to the earth via the earth port of your power outlet or a grounding rod outside. You can use these products with your regular sheets, as moisture produced by your body while you sleep means that these also become conductive. As your weight presses down on them overnight, your sheets become superhighways, allowing the earth’s free electrons to reach your body, reducing inflammation and pain. It is best to use sheets made from natural fibres such as cotton or bamboo. Earthing overnight provides a convenient and effective way of relieving your bursitis symptoms as well as improving the overall quality of your sleep. Brown D, Chevalier G, Hill M., ‘Pilot study on the effect of grounding on delayed-onset muscle soreness’, Journal of Alternative Complementary Medicine, 2010 Mar; 16 (3): 256-73.